I love big, cosy jumpers for lazy days in or simple casual wear, and I almost always wear oversized sweaters with a pair of black leggings! I've got my 'pleather' wet-look ones on today, and whilst I can't move around in them as freely as a normal pair of leggings, I do love wearing them and the sleek look they can add to any outfit. I also normally wouldn't wear this outfit with wedges for a casual day out, but I loved how the colour of these shoes matched perfectly to the jumper, and let's face it - high shoes can transform any outfit! Mohair Cross Slouch Jumper £19.99 I actually bought mine from New Look, but it's available on the AX Paris website too! Black Pleather Leggings I got these years ago as a gift, but they were from Tesco I think, though I'm sure you can get them almost anywhere now! 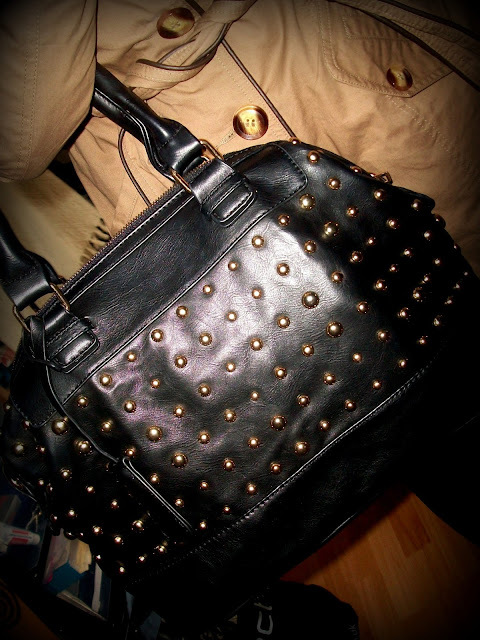 I also bought this gorgeous false leather studded handbag from Select along with the coat and I think the two go together perfectly. 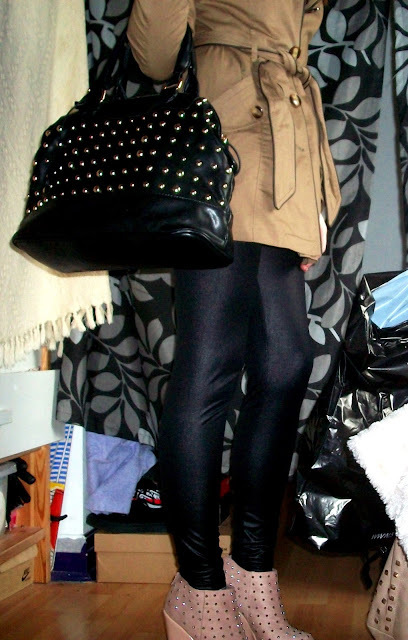 I have a bit of a thing for studs lately (hell, it's not my only studded item I own and it even matches my shoes) but I've been seeing these kind of bags everywhere and since I needed a new bag, wasted no time getting one! As well as being stylish, it's also very practical, with lots of space inside and plenty of compartments for all my bits. Oh look, what have we were - studs again! I am officially obsessed, haha! My finishing touch to match the bag and shoes - you can't go wrong with accessories. Gold Stud Ring Primark, not sure I can remember the price but I think it was around £2.00. Aww thank you! And thank you so much for following! 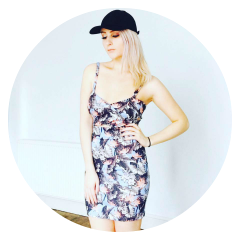 Blog's looking good, job well done indeed! Love this outfit! 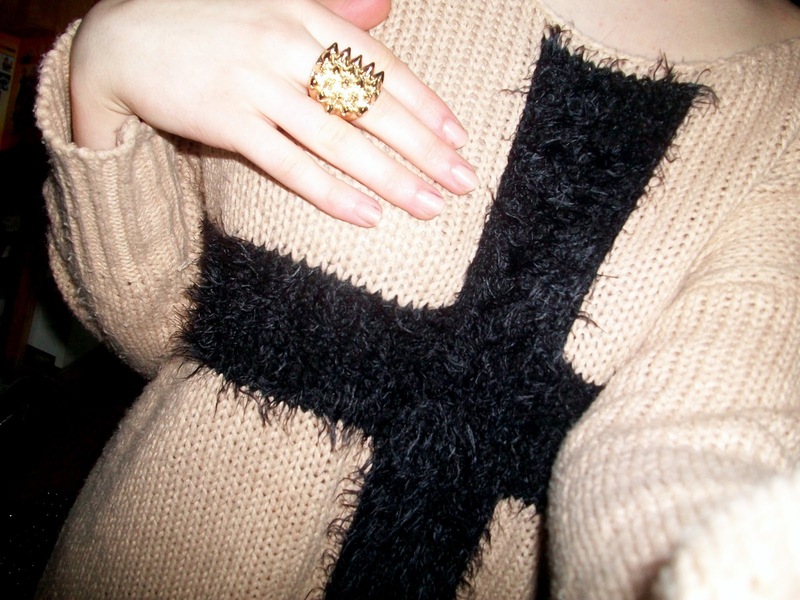 I love cozy jumpers as well...but this one is still so cute and fashionable! Thanks so much! I love it too, it's so nice when you can find something comfortable yet fashionable at the same time haha!